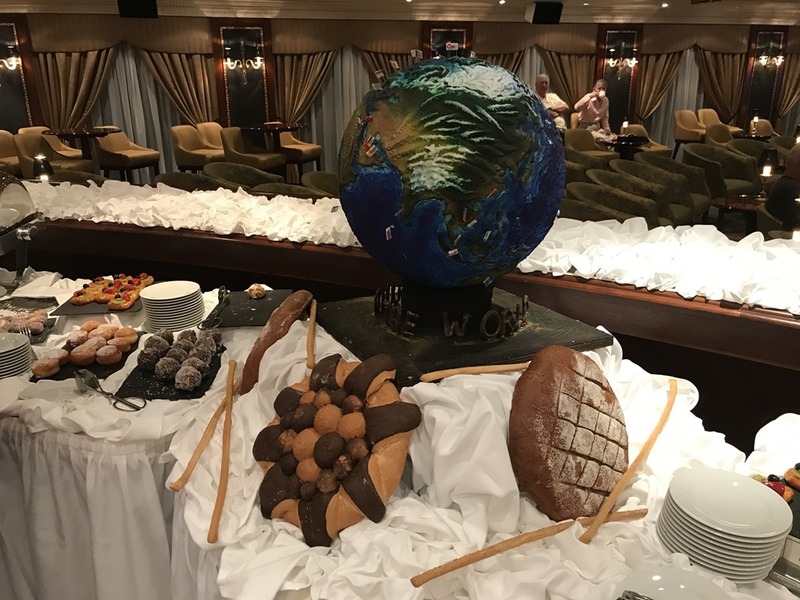 We started our day on Sunday with another Around the World coffee. 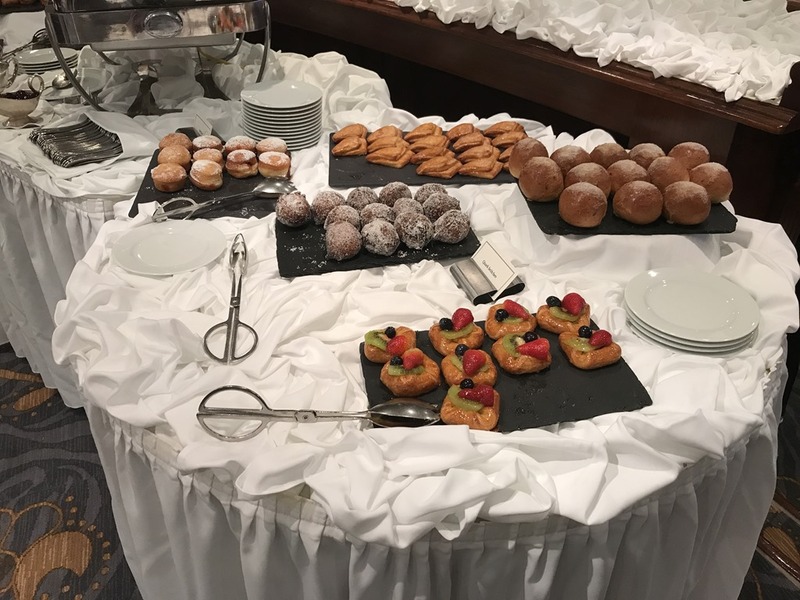 This time our chef, Farid, prepared mostly German specialty pastries including amazing jelly doughnuts. Delicious! Now that we have had our pirate drill, we also had a talk by the Captain, Maroje Brajcic about piracy in these waters. The Insignia lounge was packed! His father, who is now retired, was the Captain when the Nautica was attacked by pirates in November 2008. 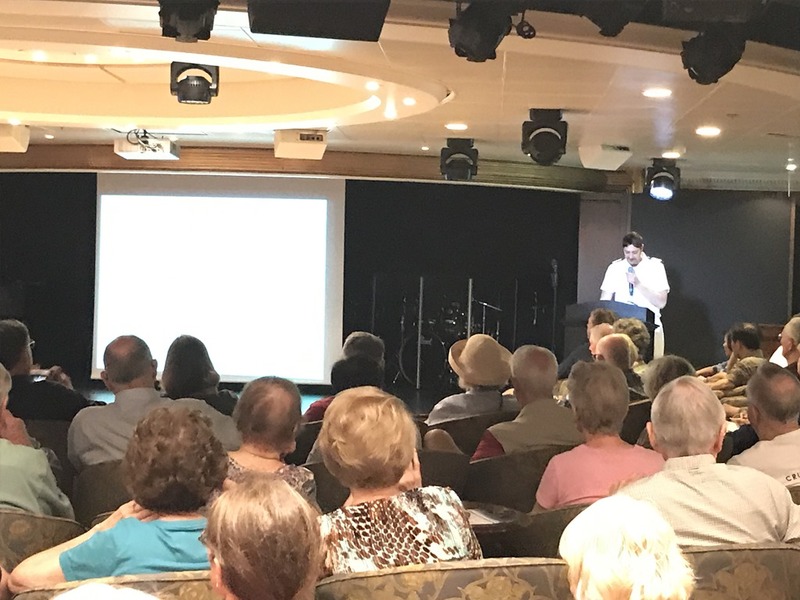 We had him as a Captain on our last world cruise and he gave a talk at that time. We learned how there are so many fewer piracy attacks now and how we are part of a group of ships that goes through this area together. One of the most amusing things that we heard before and Maroje repeated was how many passengers were out on their balconies during the attack (where the pirates did actually fire at the ship). They learned this when the Captain said they didn’t get any pictures and lots of passengers lined up at reception to share theirs! In fact, all of the pictures in the presentation were taken by passengers. So much for the instruction to stay low in the interior of the ship! There are also four extra security people on the ship, former Navy Seals. We see them in the dining room and they are very friendly. 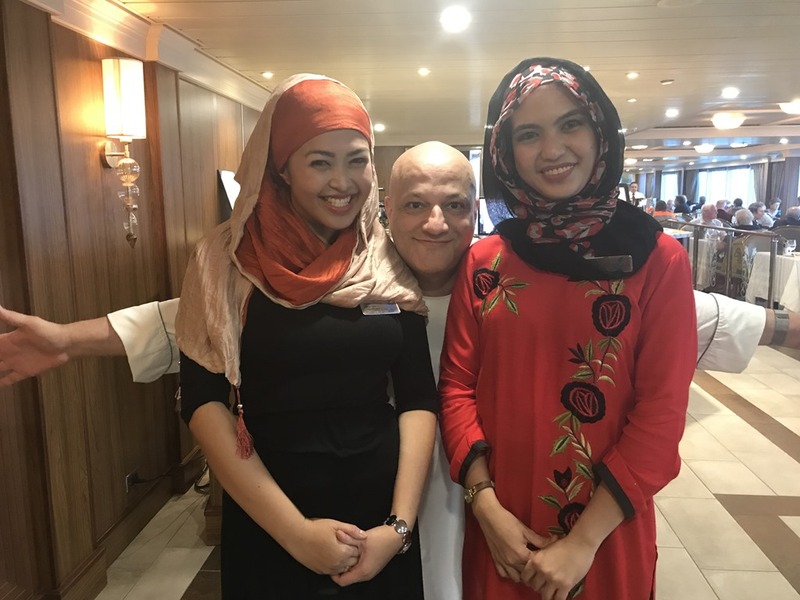 They will be on the ship until May 11 when we reach Jordan. 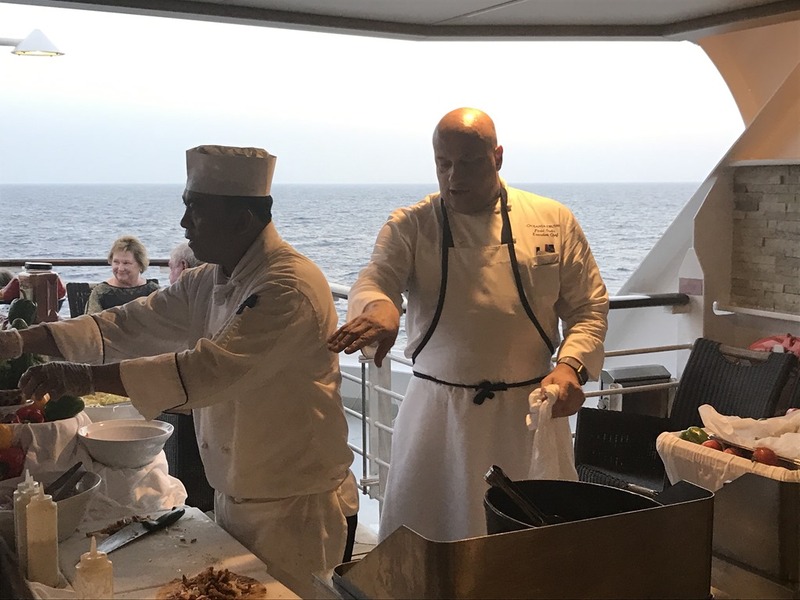 When we had cookies and milk served by the Captain last segment, Norm mentioned to our executive chef, Farid, that he wished they were Oreos, his favorite. Farid said “oh, I love Oreos too”, so when we were out in Fujairah, Norm bought some for him. So today at lunch, Farid had special oreo cookie ice cream prepared and delivered to our table! 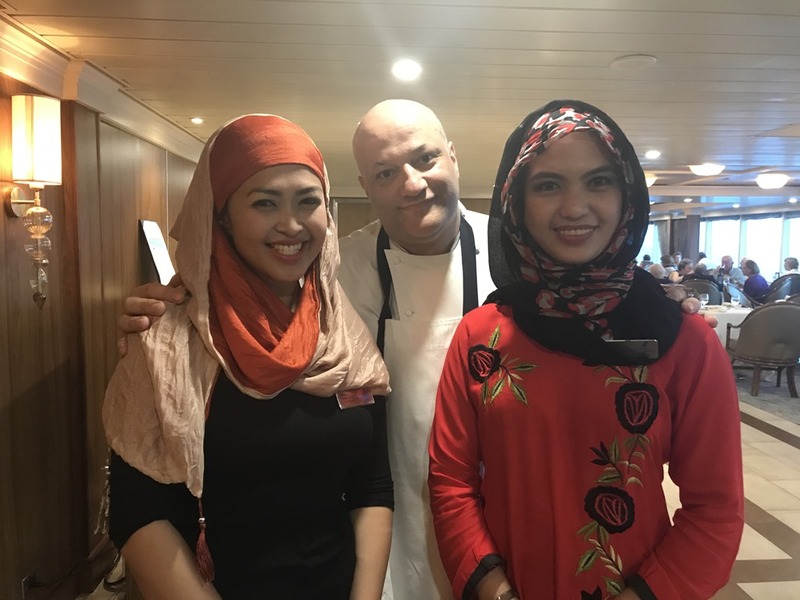 Farid is also wonderful at making sure we have the region’s special foods both in the main dining room and in the Terrace. Last night we had Arabian food – and we were greeted by Cate and her colleague in Arabic dress. And Farid got into the photo too! 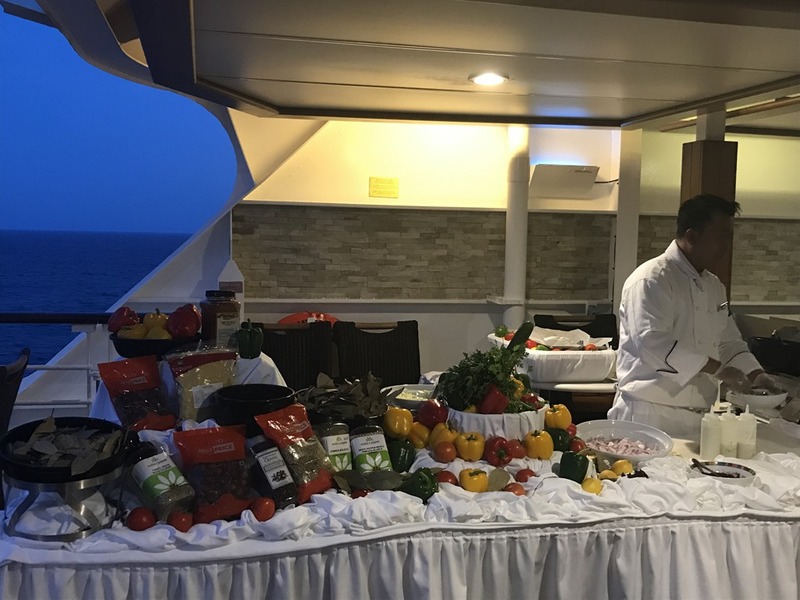 He was doing the grilling on the deck for the chicken shawarma that they served. Everything was delicious. Today we entered the Red Sea and Yemen was on our starboard side (our side of the ship) and Djibouti was on the port side. We saw no parting of the Red Sea and thankfully no pirates either! Two more sea days until we reach Jordan. Lots to keep us busy and we can also relax. I did my hour on the track and was drenched at the end. Planning to do the blackjack tournament, then watch the movie “Lion” before dinner in Polo with Shary and Rob and Norman and Rhoda. 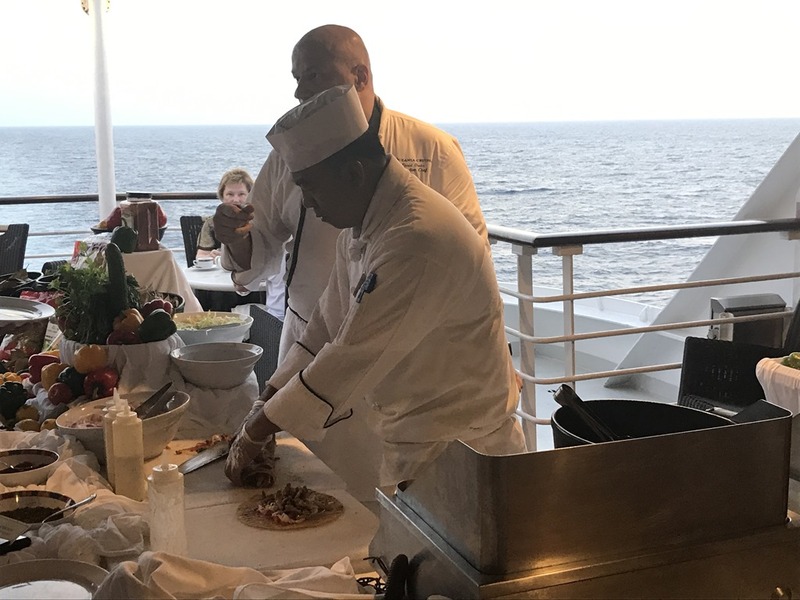 This entry was posted in Asia, At Sea, Food, May, World Cruise 2. Bookmark the permalink.